1866 Sketch of Public Surveys in New Mexico & Arizona... - the Vintage Map Shop, Inc. This is a fine print reproduction of a scarce and detailed map of the territories of New Mexico and Arizona from the mid-19th century. 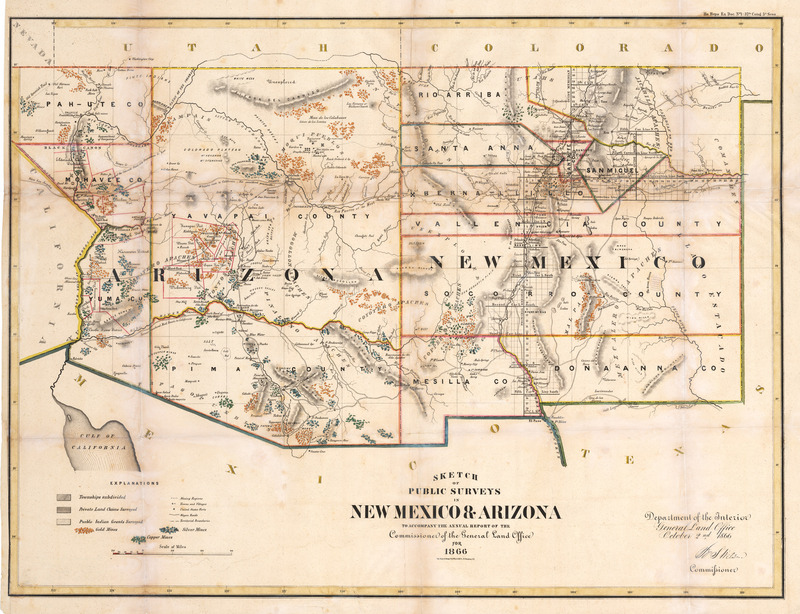 This fine lithograph map of the New Mexico and Arizona territories was made to accompany the annual report by the General Land Office of the United States in 1866. It shows the two territories divided into large counties with some smaller districts located throughout. The extent of surveyed land is confined to the New Mexico territory, along the Rio Grande and the Road to Fort Smith, Texas. There are also extensive notes regarding Private Land Claims, Indian Land Grants, Wagon Roads, and US Forts etc. Perhaps the most exciting feature the map provides is the location of numerous Gold Silver and Copper mines as well as the early towns and villages that were founded around those claims.